Apple has been coy about what the iPad Pro Smart Connector can do —up until this week, it was only used with a pair of keyboard accessories. 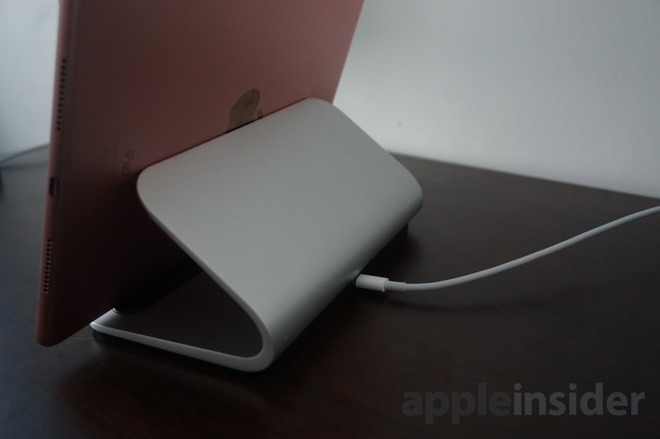 But the launch of the Logi Base has revealed that the Smart Connector can also be used to receive power, allowing a new way to charge the iPad Pro. 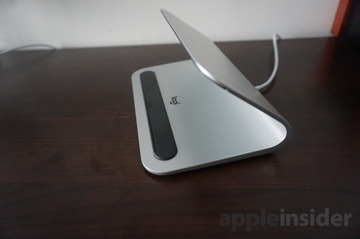 For this review, Logitech provided AppleInsider with a sample unit of the Logi Base. The dock is currently available, and priced at $99.99 direct from Logitech. Broad enough to safely hold your iPad Pro in place in landscape mode, heavy enough to stay put when you remove your iPad, and with a strong anti-slip pad on the bottom, the Logi Base is a quality accessory. 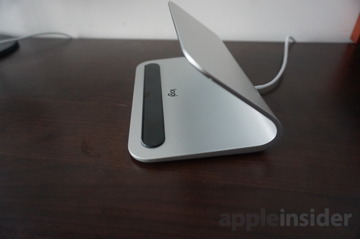 The Base is made of what Logitech claims is high-grade aluminum. It's definitely solid and attractive. The unit's points of contact with the iPad Pro are covered by a thin polycarbonate layer to prevent scratches. On the bottom one is the Smart Connector port, where you'll align it with your tablet to charge. 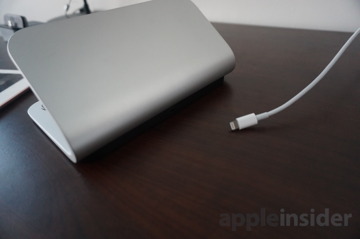 Around back, the Base has a female Lightning port where you can plug in any standard Lightning cable. The Base does not ship with a cable or a wall adapter. 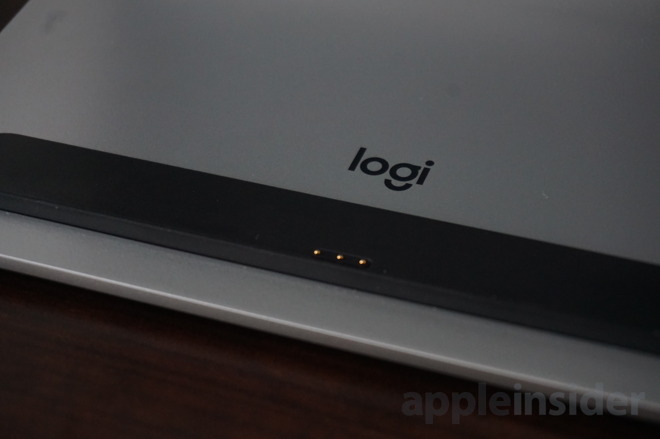 The hardware is Made for iPad certified, and Logitech has recently developed a close working relationship with Apple on Smart Connector accessories for the iPad Pro. 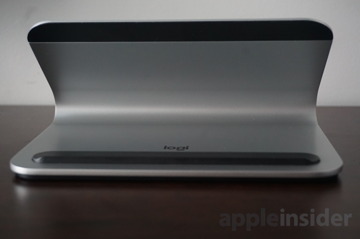 Currently, the Logi Base is the first of its kind, and the only way to charge your iPad Pro via the Smart Connector. If we have any knocks against the Logi Base design, they would be that the dock is a little on the larger side when compared to traditional Lightning docks, and that it doesn't allow you to adjust the 70-degree viewing angle for your iPad Pro if you want to use it while docked. Frankly, we don't think either of these are much of a concern, but buyers should at least be aware of the limitations of the hardware. Docking an iPad Pro onto the Logi Base is a snap. Because the Smart Connector port is magnetic, your iPad will help align itself when docked, and will securely stay in place. If you own an Apple Silicone Case for iPad Pro, the Logi Base works perfectly fine. And any case that leaves the Smart Connector port properly exposed should also work. If you have an Apple Smart Keyboard or Smart Cover, you'll need to detach them from the iPad Pro in order to charge on the Logi Base. In their current iterations, Apple's "smart" accessories do not allow a Smart Connector passthrough. The Logi Base has an input/output rating of 5.2 volts, 2.4 amps. It takes longer to charge through the Smart Connector than it does a direct Lightning connection —an estimated 7 hours for the larger 12.9-inch iPad Pro with Apple's standard 12-watt power adapter and no apps running in the background. 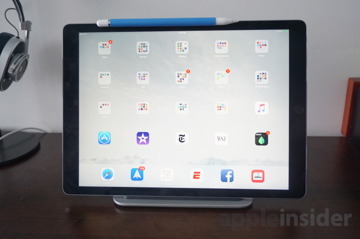 The smaller 9.7-inch iPad Pro should take about 5 hours to charge. Logitech says charging should be done via an electrical outlet, and USB port charging is "not recommended at this time." That verbiage suggests that Apple could potentially tweak the capabilities of the Smart Connector with future iOS updates. The truth is, we don't really know what the technical limitations of the Smart Connector port are at the moment. It's unclear whether the charging rates of the Logi Base are a result of the dock itself, or if the Smart Connector port is being pushed to its limits. 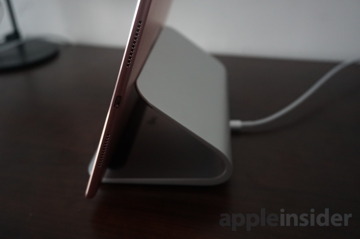 For example, the larger 12.9-inch iPad Pro is capable of charging at a much faster 29 watts with the proper wall adapter and Lightning to USB-C cable. However, the Logi Base won't take advantage of those faster charging abilities if connected to the proper cable and adapter. In addition, even though the Smart Connector is capable of transferring data, connecting Apple's Lightning to USB Camera Adapter to the female Lightning port on the Logi Base does nothing. Neither the 9.7- or 12.9-inch iPad Pro recognize the accessory once connected, meaning the dock is power-only —for now. We'd like to see power-plus-data capabilities come to the Logi Base —and other Smart Connector accessories —in the future. 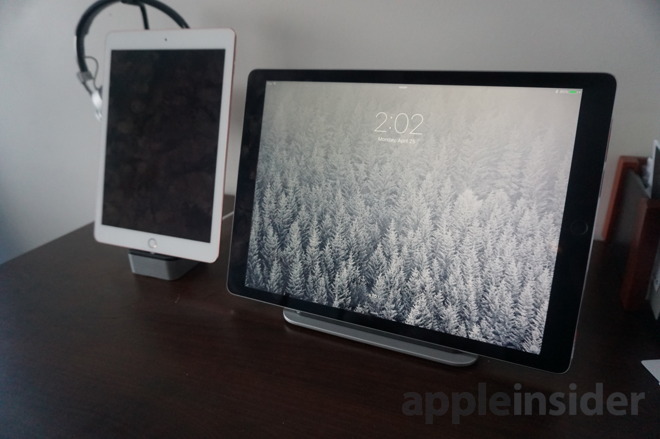 For example, if it were possible, leaving a USB adapter and power plugged into the Logi Base could allow users to quickly dock, charge and use accessories with the iPad Pro in a pinch. There's a lot of potential here, and we're excited to see where it goes. Priced at $100, the Logi Base may carry sticker shock for budget-minded consumers. But there are plenty of other docks priced similarly, such as the Elevation Dock or the Mophie Desktop Dock. Still, $100 for a dock that charges slower than Lightning will be a dealbreaker for some, so this accessory isn't for everyone. For us, the convenience of Smart Connector charging and the quality construction of the Logi Base justify the price. 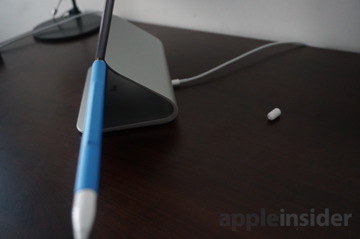 If you're an avid Apple Pencil user, the Logi Base also has the added benefit of allowing you to charge the iPad Pro and the Pencil, through the iPad's Lightning port, simultaneously. We think this alone will be a huge benefit for artists. There is some room for improvement. It would be nice to offer adjustable viewing angles, and supporting simultaneous power and data transfer would be a benefit for some. Still, after a week of using the Logi Base, it's quickly become our preferred way to charge the iPad Pro. Recommended. 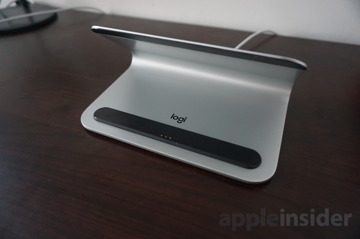 The Logi Base is available to purchase from Logitech for $99.99. It ships for free.